The internet is a limitless source of information and has provided us a new avenue for dialog and discussion. But, when conversations are logged in perpetuity, open to the world and never ending, do they lose relevance? Some websites manage upwards of 70 million comments a year and involve thousands of people. When browsing almost any website you'll witness passionate, and sometimes ridiculous, accusations and affirmations. 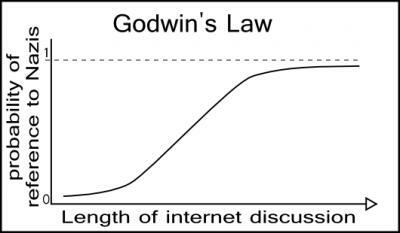 This phenomena is so common and appeared so early in the birth of internet that in 1990 Mike Godwin, general counsel for the Wikimedia Foundation, proclaimed, "As an online discussion grows longer, the probability of a comparison involving Nazis or Hitler approaches 1." This adage became "Godwin's Law." The computer guys explore the tangled web of threads, comments, and forums trying to discover if online dialog has a useful purpose. What's your experience with online discussions? Contact us by Email, Twitter, Facebook, calling us during the show at ​816-235-2888 or, dare we say, comment below.